Steeped in history, the Burton's menswear collection is an impressively eclectic lineup of smart, tailored attire and casual garments. Eighteen-year-old Montague Burton founded his eponymous company in 1903 in the English borough of Chesterfield. 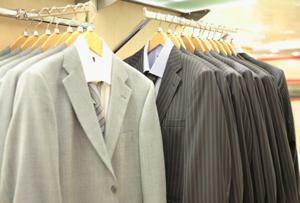 His goal was to create a collection of high quality suits at affordable prices for the everyday man. During World War I, the company began to produce uniforms, and dressed almost a quarter of the country's entire armed forces. The company thrived, and by 1929 it ran some 400 factories and shops. As Burton went public and the company grew to even greater heights, it did not lose sight of one of its original purposes: to produce quality uniforms for the soldiers. Again, then, the company committed to this cause during World War II. Burton himself even designed a special suit for war veterans, affectionately dubbed "The Full Monty," a cheeky reference to the complete three-piece suit and Burton's first name. Even after Burton's death in 1952, the company enjoyed great success. In fact, at the time, it was said to be the biggest tailoring company in the world. Through the years, it continued to outfit various luminaries, such as World Cup and Euro 2000 champions. The line expanded beyond suiting to include casual wear, nightwear, clothing for big and tall sizes, shoes, accessories and much more. Today, the Burton legacy lives on. The company operates over 400 stores in both the UK and Ireland, and also boasts a full service web site. Whether you're in the market for something relaxed and comfortable for the weekend or a crisp, no-fuss ensemble for a meeting or special occasion, you're sure to find it in Burton's menswear collection. The full lineup includes everything from dress shirts and pajamas to cardigans and jeans. It's quite a varied range, and there is something to suit men of all ages. Proof that Burton's menswear is on top of the trends: The company's T-shirt lineup includes novelty tops that feature popular bands, like The Doors, The Beatles and Guns 'N' Roses. Also in the mix are retro-inspired football shirts, inspired by popular games from years past. A wide range of reasonably priced plain and print T-shirts, tank tops and polo shirts are also available. For something more pulled together, look to the casual shirts selection, which includes lightweight, button-down tops in a variety of solid colors and prints. From plaids to stripes, there's something here for everyone. Of course, formal shirts are also widely available in your choice of solids, checks or stripes. These crisp tops are perfect to pair with a Burton suit, and are available in regular, tailored and slim cuts. Some are packaged in sets with complementary neckties. You'll need a pair of smart trousers to pair with your formal shirt! Look for tailored styles with both pleated and flat fronts. On the casual front, you'll find everything from youthful cargo pants to jogging pants in a host of colors.No collection would be complete without a selection of jeans! Burton's menswear range offers many cuts and varieties, including straight legs, boot cuts, worker styles, tapered legs, loose fits and more. No matter what time of year it is, you'll find a great selection of jackets at Burton. The range includes classic biker styles, trendy baseball jackets and utilitarian hooded jackets. The outerwear collection also includes relaxed hoodies and zip-ups, perfect for throwing on with a pair of casual jogging pants or jeans. No mention of Burton would be complete without a nod to the company's famous suits. Ideal for occasions big and small, these suits are available in slim, regular, tailored and big and tall fits. You might choose to purchase each item individually, or opt for the convenient "bundle," which includes a suit, shirt, tie and pair of shoes. This takes the guesswork out of getting ready, and is only available online. The company offers so much more in its Burton's menswear range too, including robes, pullover sweaters, shorts, swim trunks, casual and formal footwear, sunglasses, watches, belts and socks, to name but a few. For men who want to save money and look their best, Burton offers everything they need in one convenient place. Shop the entire collection online or visit the store locator for the shop nearest you.